Collaboration is a key component of educator growth. Sharing ideas, experiences and resources builds community and improves instruction. Padlet makes collaborating simple, but your teachers might not be familiar with the platform - we'll show you how you can integrate it seamlessly into your district's technology toolkit. Collaboration has become a serious buzzword in education over the past few years. Teachers are encouraged to collaborate with one another, and foster collaboration among their students. Project-based learning, collaborative classroom environments, and collaborative tech tools are becoming increasingly popular. Is this intense focus on collaboration just edu-jargon? The research says no. In a three-year study conducted by the UChicago Consortium, researchers found that social relationships within the school community had a significant impact on learning outcomes. They studied how teachers, administrators and parents worked together to transform their schools. "In schools characterized by high relational trust, educators were more likely to experiment with new practices," and "were also more likely to demonstrate marked gains in student learning." Collaboration takes many different forms, from staff meetings to informal hallway conversations, intentional sharing sessions to department meetings. But what about collaborating when you can't meet face-to-face? That's when Padlet can come in handy. Padlet is an online application that makes it easy for students and educators to collaborate on just about anything (and any topic)! Users create flexible boards, where they can post ideas, documents, files, photos, websites and drawings. But Padlet is much more than an online bulletin board. The site encourages users to get creative, with customizable layouts, drag-and-drop features and beautiful backgrounds. Padlet content creators use the site in a variety of different ways: as a portfolio, a blog, a website, or an idea board. Informal assessments: Post a question about today's lesson, then review student responses for comprehension. Studying current events: Keep students informed by posting recent news articles relevant to their learning. Notetaking: Students can use Padlet to take notes, or post questions during a lecture. Worldwide collaboration: Create public Padlet walls and share the links with a partner school across the country (or even the world!) to bring new perspectives to your students. Surveys & ideas: Pose a question on how to improve your classroom, and let your students respond on Padlet. They can add documents, links and drawings to envision their perfect learning environment. Storytelling: Start a story and let students take from there. Create a scenario, and ask your students what happens next - let them take turns one-by-one or in groups to write their own adventure. The Padlet Backpack for schools plan includes features like: student reports, extra security, personalized branding, LMS integration, data analytics and content filtering. We believe that one of the best ways to learn is through active participation - that's why our platform offers districts the opportunity to create (and evaluate!) experiential learning activities for teachers. Finding the time to introduce educators to new tools can be difficult with conflicting schedules and available professional development hours and budgets. 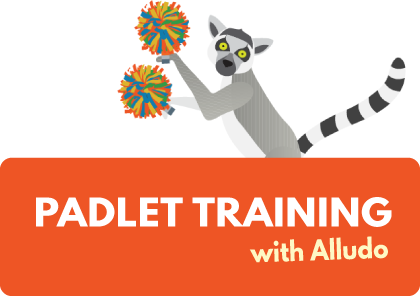 Rather than hosting a Padlet workshop, our districts are leveraging Alludo to teach educators how to use Padlet - at their own pace, and in a way that suits their specific classroom needs. Our catalog features many Padlet-focused activities from our districrts that teach educators how to get started and use the tool in their classrooms. Take a look! Our platform offers you a way to customize professional development and learning activities that are specific to your district's needs. If you don't find an activity that works for you in our catalog, you can easily create one of your own. Some of our districts have incorporated Padlet into reflection activities, digital citizenship lessons and more - using Padlet collaboration for their own specific initiatives. Activity customization isn't limited to changing the steps teachers need to take to learn how to use the tool. You can also choose how they will demonstrate their learning: via a link to their Padlet, a screenshot of their Padlet board, or a written reflection on how Padlet has contributed to collaboration with their peers or among their students. Find more features on Padlet's support page (which of course is set up as a Padlet)!